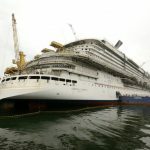 Carnival Cruise Line’s newest ship, the 133,500-ton Carnival Horizon, is pictured here at the Fincantieri shipyard in Marghera, Italy, where it is being constructed in anticipation of its spring 2018 debut. The 3,934-passenger vessel — the 26th ship in Carnival’s fleet – will offer many of the innovative indoor and outdoor dining, bar, entertainment and activity options that debuted on Carnival Vista, along with a brand new first-of-its-kind Dr. Seuss-themed WaterWorks aqua park. Carnival Horizon will also offer a fun bike-ride-in-the-sky attraction called SkyRide and an IMAX Theatre. A variety of cabin categories, including spa cabins with exclusive privileges at the Cloud 9 Spa, extra-roomy staterooms in Family Harbor, and tropical-inspired Havana staterooms and suites with exclusive daytime access to a Cuban-themed bar and pool, will be offered as well.